It’s almost certainly not aliens, but once again, Tabby’s Star is acting hella weird. The star that first became our planetary obsession back in the fall of 2015—when astronomer Jason Wright suggested its weird flickering behavior might be the result of an alien megastructure—is, once again, flickering. But unlike previous stellar glitches, astronomers are now prepared to study it in the act. The world was first alerted to a alien signal mysterious change in the star’s light output in a tweet from Wright this morning. As reported by Popular Science, Fairborn Observatory in Arizona confirmed that the star’s light output has recently dimmed by approximately 3 percent. As with previous dimming events, this can’t be easily explained by any ordinary stellar behavior. Past explanations for the star’s fits and starts include a swarm of cometary fragments, a recently-annihilated planet (full disclosure: my brother, an astronomer at Columbia University, came up with that one), and, every true believer’s favorite, an alien megastructure. 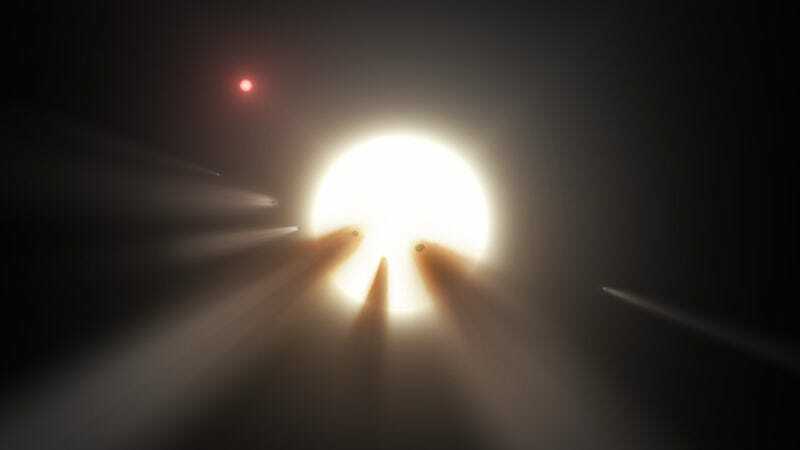 Tabby’s Star, or KIC 8462852 as it was first identified in the Kepler space telescope database, has confounded astronomers since its unusual light curve was first spotted by citizen scientists. Over four years of Kepler observations, the star’s light output intermittently tanked, dropping by roughly 20 percent on one occasion. The more astronomers looked at the star, the weirder things got. An analysis of old photographic plates hinted that the star’s light output diminished a whopping 19 percent over the 20th century, and a subsequent analysis of Kepler’s data seemed to confirm long-term dimming. It was soon decided that the only way to solve the mystery would be to observe the star in the act of dimming across the electromagnetic spectrum. Following a successful crowdfunding campaign by star-discoverer Tabetha Boyajian last spring, that’s exactly what astronomers have been gearing up to do. As I’ve explained previously, Kepler’s data on Tabby’s Star consisted of a smear of white light. More precise measurements at different wavelengths could help us zero in on whatever material is actually occluding it. A spectra with high absorption in blue and ultraviolet wavelengths, for instance, could point to a giant blob of dust around the star, while an excess of infrared radiation may support the comet hypothesis. But what would support the theory of a vast alien construction project? Only the most extraordinary evidence—although at this point, as long as the star continues to defy natural explanations, the nerds in the room can dream on. Exciting stuff! I’ve reached out to Boyajian and Wright for comment on what the next steps are, and I’ll update this post if I hear back. If you’re keen to learn more right now, SETI’s hour-long conversation with Wright today, embedded above, is chock full of additional information. Update 3/22: Tyler Ellis, an astronomy graduate student working with Tabetha Boyajian, updated Gizmodo via email this weekend to let us know that the follow-up response has so far been “pretty extensive.” For photometry (counting light particles being emitted in different parts of the electromagnetic spectrum) observers at the Los Cumbres Global Observatory and the KELT planet hunting network are viewing the star in optical, while the SWIFT ultraviolet space telescope, the Subaru telescope, and the Large Binocular Telescope are studying its infrared glow. Other collaborators are doing spectroscopy, trying to figure out which areas of the spectrum, exactly, are dimming. Still others are attempting to measure the polarization of light emitted by Tabby’s star, which can help determine whether the dimming is caused by something in the interstellar medium.